German War Crimes - Who Was to Blame? Does Jesus Christ have many different church denominations each teaching a different "gospel" and practicing different doctrines — doing His Work? Is Christ divided? How, when and where did this religious Babylon of hundreds of denominations get started? And how does one recognize the true Church? LIKE A vast religious supermarket, modern society offers a superabundance of prepackaged and widely diversified Christianity. Looking over the conflicting panorama of Christian denominationalism, one sees a remarkable spectacle indeed! Today's salvation scene is a glittering array of every conceivable style and type of "Christianity." Whatever your tastes or approach to religion, there is something for you. The time is Sunday morning. The place is a typical American city of medium size. It is the day those who profess Christianity attend the church of their choice. Some have chosen the large and ornate cathedral at the top of the hill. It is among the most prominent structures in the city. Inside, several hundred devout worshippers kneel piously before a decorative altar as the pungent odor of burning candles wafts through the stale air. Intricately carved figurines line the soaring walls as the robed figure conducting the services monotonously mutters in a language not understood by most of the congregation'. Around the corner and up the block another service is being conducted in the name of Jesus Christ. Here it is a congregation that speaks in an "unknown tongue"! The phenomenon is commonly known as "glossalalia." Supposedly, these worshippers are speaking in a language inspired by "the Spirit." Eyes glazed, backs arched in ecstatic frenzy, participants of all sizes and shapes may be seen writhing and twisting on the floor of this simple, one-room, "pentecostal—" type church. Lips move uncontrollably as unintelligible gibberish gurgles from the throats of grotesque figures. The air is literally laced with rhythmic organ and piano sounds as others shout "Hallelujah!" and "Praise Jesus!" Can anyone fault such devotees for a lack of sincerity and enthusiasm? Not all congregations are this "turned on," however. Some Sunday services are conducted with quiet Protestant dignity and decorum. Just down the street the stained-glass tones of a more sedate preacher may be heard as pink platitudes are presented to a composed and dignified congregation. Following a short ten—minute "sermon," a gorgeously robed choir fills the air with the strains of an old favorite hymn known and loved by all. The majestic sounds of a huge pipe organ accompany the choir as the congregation joins in singing praise. Still another church with a difference, however, may be found near the freeway. This is the "drive—in" church. Here the attendees need never leave their automobiles to participate in worship services. A flip of their car radio dial will tune them in to their pastor who preaches from a raised platform in front of a large parking lot. At least if parishioners don't appreciate the words of their preacher, they always have the option of tuning him out! Some may choose to tune in one of the many "radio evangelists" who fill the air waves with weekly doses of religion in a variety of packages. How People Choose a Religion Everyone "knows" one religion is about as good as another. Still, every person who goes to church "knows" his particular brand of religion will probably get him to "heaven" a little more quickly, a little more efficiently, than all the others. Either he believes this, or he is settling for second best. Ever notice the remarkable similarity between claims of dozens of religious philosophies and the detergent ads? One claims it washes your clothes "cleaner than clean "! The fact that such a statement is an impossible exaggeration never occurs to people. Still another claims it gets your clothes "cleaner." But "cleaner" than what? Other soaps and detergents? How can this be possible? All of them claim to get clothes "cleaner," too. How accurate would it be for you to adopt the idea that "all these detergent ads can't be wrong"? Let's ask the question another way. Can they all be right? If any one of them is to be believed — positively — then every other one must automatically be assumed to be wrong. If any one of them really does get your clothes cleaner — then the unspoken inference is that they get your clothes cleaner than any other product. What about religious philosophies? People say, "But all these religions, these organizations, these philosophies can't be wrong." But can they all be right? Utterly impossible. If any one of them is right – and remember, they all differ — then that one being right automatically renders all others wrong. But in "choosing" a religion, a faith, or a church — thousands pick and choose just as if they were selecting colorful boxes of soaps and detergents from the shelves of the supermarket. Surveys show many frankly admit they attend their church because of its size, its standing in the community, its nearness to their home, or the parking facility. Only a few admitted they had given at least a little time to searching into what the church taught. Fewer still seemed to wonder whether it has the truth of God's Word! What about you? Will you accept God's true religion based on His Word? the radio. The lineup of electronic "evangelists" seems to be almost endless. Some listeners are asked to "establish a point of contact" by placing their hand on the radio. Preaching styles are many and varied. Some "evangelists" wheeze in a raspy fervency while others shout in stentorian tones appealing to their listeners to "send in your love offerin's to keep this ministry on the air." Every psychological device known to man is used to invoke a response from the masses "out there in radio land." "A generous offerin" will bring the listener anything from a prayer cloth cut from the revival tent to "sacred willow twigs." But radio has its limitations. Many "evangelists" have now turned to the more effective medium of television to peddle their brand of salvation. Only the more successful radio evangelists have been able to utilize the costly medium of television. Elaborate costumes and sets, big—name entertainers and professional direction and production are essential for effective presentation. More and more radio preachers are making the transition as television becomes firmly ensconced as the most effective method of mass communication yet devised by man. Some peddlers of piety have ignored both radio and television. They have retained the older "tent meetin" approach. These itinerent preachers travel from town to town holding revival meetings and tent campaigns, relying on their personal magnetism and charisma to gain followings. Small town populations often turn out en masse for such presentations because they are the only available form of entertainment. Nothing can quite match the show business pizzaz of some of these revival preachers. Every performance is a triumph of dramatics, applied psychology and stage presence. Audiences are urged to contribute heavily as they are swept by wave after wave of religious emotionalism. "Decisions" are made and hearts are given "to the Lord" year after year as revivalists capitalize on the ignorance of comparatively uneducated masses who thirst for a relationship with their Creator. No nation surpasses America when it comes to broad — casting and advertising its way of life to the world. And she is no exception when it comes to her religious wares. "Evangelists" and missionaries have been sent to the four corners of the earth in an effort to "spread the word" and "win souls for Christ." Britain too was bitten by an unusual missionary zeal and has contributed heavily to the spreading of Protestant sectarianism around the world. Other colonizing nations such as Holland, Germany, France and Spain have also had their part in proliferating their own brands of Christianity around the globe. The world view of Christianity is both confusing and upsetting. Though there has been no U.S. census of religious bodies since 1936, the 1972 edition of The Yearbook of American Churches lists some 246 denominations in America alone. This estimate does not include many smaller and more obscure sects, independent churches and other groups. Canada, a nation of less than 25 million inhabitants, claims some 74 denominations of Christianity. Even pre — dominantly Catholic Italy lays claim to 13 Protestant denominations within its borders. Black Africa, on the other hand, has some 5000 sects all claiming roots in Christianity! This does not include the basically European or white denominations and sects on that continent. All these denominations and sectarian divisions claim the label "Christian." But are they really? Is Christ divided? How many churches did Jesus of Nazareth establish? Is God the author of such confusion and division? 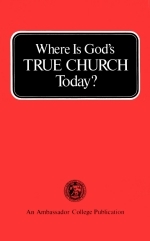 Where is God's one true Church today? Chapter Two — Why So Many Denominations? IS JESUS the author of modern denominational confusion? Is Christ divided into hundreds of dissonant sects and denominations? Jesus Christ did not found many denominations. He said, "I will build my church ..." (Matt. 16:18). And He did build it. One Church, commissioned to preach the gospel of the Kingdom of God to the world. But what do we find today? Hundreds of churches, founded by men, all disagreeing with each other! Jesus Christ said such things would happen! He warned you would be living in a world literally filled with religious confusion. He said, "Take heed that no man deceive you. For many shall come in my name, saying I am Christ; and shall deceive many" (Matt. 24:4, 5). Notice Christ said many would come "in my name," that is, using the name of Jesus Christ as if they had His authority. In Jesus' day there were no "Christian" denominations. The Jewish religious leaders sat in Moses' seat and judged in both religious and civil matters (Matt. 23:1-2). Jesus acknowledged their authority (verse 3). But he also made it clear that they were disqualifying themselves from further service as God's earthly representatives. Because of their hypocrisy and internal corruption, they were no longer fit to administer the way into God's Kingdom (Matt. 23:4-28). Jesus told them: "Therefore say I unto you, The kingdom of God shall be taken from you, and given to a nation bringing forth the fruits thereof' (Matt. 21:43). But who was that "nation"? To whom did Christ give the responsibility of administering the way into His Kingdom? Peter, addressing the Church of God, wrote: "But you are a chosen race, a royal priesthood, a dedicated nation, and a people, claimed by God for his own, to proclaim the triumphs of him who called you out of darkness into his marvellous light, Ye are now the people of God, who were once not his people; outside his mercy once, you have now received his mercy" (I Peter 2:9, The New English Bible). Christ's own Church is now the vehicle through which God does His work. But aren't there many churches through which Christ administers salvation? Jesus' final prayer for His Church provides the answer. "I pray for them: I pray not for the world … Holy Father, keep through thine own name those whom thou hast given me, that they may be one, as we are" (John 17:9, 1). Again, the Apostle Paul plainly said, "There is one body, and one Spirit, even as ye are called in one hope of your calling; one Lord, one faith [body of beliefs], one baptism … " (Eph. 4:4-5). Christ is not divided! He founded only one Church with a single body of beliefs and doctrines. Nowhere in the Bible do we find God's Church described as a large and influential body in the world. On the contrary, we find Jesus addressing the Church as the "little flock" (Luke 12:32). "If they have persecuted me, they will also persecute you," said Jesus to His disciples (John 15:20). "… All that will live godly in Christ Jesus shall suffer persecution," wrote the Apostle Paul (II Tim. 3:12). On the night Jesus was seized to be crucified, He said, "It is written, I will smite the shepherd, and the sheep shall be scattered" (Mark 14:27). Later, in Acts 8, we read of a great persecution which caused the Church to be scattered throughout the regions of Judaea and Samaria. And the small, yet united, Church of God has been scattered over the face of the earth, to one degree or another, ever since. On the other hand, Jesus warned: "And many false prophets shall rise, and shall deceive many" (Matt. 24:11). It was the majority — the many — that were to be deceived by a bogus, counterfeit Christianity! Jesus said, "Wide is the gate, and broad is the way, that leadeth to destruction, and many there be which go in thereat: because strait [difficult] is the gate, and narrow is the way, which leadeth unto life, and few there be that find it" (Matt. 7:13-14). Christ revealed in Revelation 12:9 that the whole world is in a state of deception. "And the great dragon was cast out, that old serpent, called the Devil, and Satan, which deceiveth the whole world …" All of society has come under the deceptive influence of this powerful, yet incredibly evil spirit being. He is called "the god of this world" in II Corinthians 4:4. Satan the devil has his ministers. Paul wrote: "For such are false apostles, deceitful workers, transforming themselves into the apostles of Christ. And no marvel; for Satan himself is transformed into an angel of light. Therefore it is no great thing if his [Satan's] ministers also be transformed as the ministers of righteousness; whose end shall be according to their works" (II Cor. 11:13-15). To understand what a false prophet (a minister of Satan) is, it is easiest to define the contrast of a true prophet — a true minister of God. This is the shortest approach because there is only one true ministry, but there are many false ones. If we define a true minister, then all others who do not fit that definition will be revealed for what they are. One: A true minister of God must study, preach and live by every word of God—including the Ten Commandments. If a man tells you something that he knows disagrees with God's revealed Word, he instantly disqualifies himself from being a true minister of Christ. Isaiah 8:20 and Matthew 4:4 confirm this. Two: A true minister will teach the exact same gospel Jesus did— the good news of the coming Kingdom of God. He will teach repentance of sin and acceptance of Christ's shed blood as a remission for those sins. But he will also teach the very meaning of life — that we are made in God's image to be finally born into His very family, that man is to overcome and develop character so he can become like God his Father, qualified to join other spirit — born saints in literally ruling the world under Christ's direction (Rev. 2:26). Three: A true minister must be busy doing the Work of God. Busy warning a sick and cynical world where its sins are leading it, busy broadcasting, preaching and announcing the good news of the soon-coming Kingdom of God (Matt. 24:14). He will have a deep understanding of biblical prophecy. He will make these prophecies come alive with power — warning this sophisticated, modern world of Christ's imminent return, and focusing especially on the soon — coming Kingdom —the literal government of God —to be set up in the wonderful world tomorrow. Four: A true minister can be identified by the fruits of his ministry. What kind of results are being produced by his efforts? Are lives being changed for the better? Are problems being solved? Do his words contain answers, or are they mere platitudes and the quoting of poetry? These are key points. Unless a man fulfills these absolutely basic requirements, he is an imposter, merely masquerading as a minister of Christ! [Editor's Note: If you would like to meet and counsel with one of God's ministers— let us know and we'll put you in contact with one in your area. See page 41 for further details]. Maybe you are thinking, "Well, surely there are very few ministers who would dare to deliberately twist God's Word and deceive people. The ministers I know are sincere and honest. Fine men." And undoubtedly there are many very sincere men in the ministry. But it is possible to be sincere and yet also be very much deceived. It is entirely possible to be sincerely wrong! You see, God did not say the false prophets would be in the minority. God tells us there will be many such individuals. Remember, Christ said: "For many [not a small minority, but the many] shall come in my name [claiming to represent Christ], saying I [Jesus] am Christ [proclaiming Jesus of Nazareth as Saviour and Messiah]; and shall deceive many." So says your Bible in Matthew 24:5, 11. Here God shows us that vast numbers of people would be deceived by great numbers of false ministers who would falsely claim to represent Christ. Now you know how to recognize the true men of God and also how to pinpoint a false prophet. The true Church of God came into being in 31 A.D. on the Day of Pentecost. God blessed it with a great out — pouring of His power— His Holy Spirit (Acts 1:8; 2:1-8, 17-18). Soon after, the great false church had its beginning. Even in the earliest of Paul's epistles, he informs us that "the mystery of iniquity doth already work" (II Thess. 2:7). Paul apparently wrote this in 50 or 51 A.D. The plot to supplant the truth had already begun. Notice, the cleverly disguised teachings of iniquity or lawlessness were at work in Paul's day. The Roman world was being filled with numerous mystery religions which stemmed from the old sun-worshipping mysteries. In the later epistles of Paul, and in those of the other apostles, we find it gaining considerable momentum. The apostles, instructed directly by Jesus Christ, constantly warned the Church about the great departure from the faith that would begin to occur at the close of their ministry. Scarcely twenty years after the crucifixion of Jesus, the Apostle Paul, in one of his first inspired letters, cautioned Christians not to be deceived by false preaching or by false letters purporting to be from the apostles. "Let no man deceive you by any means: for that day [the time of God's intervention in human affairs when Jesus Christ will return to rule the nations] shall not come, except there come a falling away FIRST" (II Thes. 2:3). In Acts 20:29-30, the teacher of the Gentiles explains how the apostasy would begin. He gathered the elders (ministers) of the Church at Ephesus to deliver them a final message concerning their responsibility over the local congregations. "For," said Paul, "I know this, that after my departing shall grievous wolves enter in among you, not sparing the flock. Also of your own selves shall men arise, speaking perverse things." Why? "To draw away disciples after them." To gain a personal following for themselves! To start a new denomination! Do you catch the full significance of these two verses? The elders or ministers were especially assembled because, immediately after Paul would leave Ephesus, there would come within the local Church congregations false ministers, wolves in sheep's clothing, to make a prey of Christians; and even from those elders already in the Church congregations some would pervert the doctrine of Jesus to secure a following for themselves. Not only Paul, but also Peter, warned the churches that MANY would be misled. There were false teachers among Christians who would bring in heresies, "and MANY shall follow their pernicious ways; by reason of whom the way of truth shall be evil spoken of' (II Pet. 2:2). False teachers secretly professed to giving a hidden, yet easy, way to evade the consequences of breaking God's law. Jude had to include in his letter the admonition that every Christian "should earnestly contend for the faith which was once delivered unto the saints. For there are certain men crept in unawares, who were before of old ordained to this condemnation, ungodly men, turning the grace of God into lasciviousness, and denying the only Lord God, and our Lord Jesus Christ.... These be they who separate themselves, sensual, having not the Spirit" (Jude 3, 4, 19). Although numerous deceivers, called Gnostics, left the Church, drawing away disciples after them, there was an even more dangerous apostasy which infiltrated the true Church. In instructing the Evangelist Timothy, the apostle to the Gentiles instructed him to "reprove, rebuke, exhort with all longsuffering and doctrine. For the time will come when they will not endure sound doctrine; but after their own lusts" — the congregations wanting to do what they please—"shall they heap to themselves teachers"—elect ministers who will preach what they want to hear — " … and they shall turn away their ears from the truth, and shall be turned unto fables" (II Tim. 4:2-4). This was in the days of the apostles and evangelists. Many who fellowshipped in the local congregations of the early Church, after about two generations, did not endure sound doctrine because they had not repented and received the Holy Spirit. They elected teachers who, for the sake of money, pleased their wishes by preaching fables — the enticing fables of mysticism and sun-worship that were engulfing the Roman Empire. The letters of Paul were twisted by them to give another meaning than intended (II Pet. 3:15-16). But instead of leaving the local congregations and forming their own sects, as some Gentiles did at first, the false preachers remained within the congregations and soon began to expel the true Christians. In the letter of the Apostle John to Gaius, we read: "I wrote unto the church: but Diotrephes, who loveth to have the preeminence among them, receiveth us not. Wherefore, if I come, I will remember his deeds which he doeth, prating against us with malicious words: and not content therewith, neither doth he himself receive the brethren, and forbiddeth them that would, and casteth them out of the church" (III John 9-10). The true Christians, who alone comprised the true Church, were being put out of the visible, organized congregations. They were the SCATTERED ones of whom John said: "Therefore the world knoweth us not" (I John 3:1). In the Western Roman Empire, where Paul died, the state of Christianity was even more advanced along the paths of error. The name Christian was being borne away by leaders who crept into the fellowship of the Church of God and who, in the name of Christ, deceived the many into following their false teachings. The two churches (one false and one true) continued to grow and extend their influence over vast areas of the Roman Empire. The Apostle Paul reached many Gentile areas with the truth of God. But he was constantly opposed by Jewish and Gentile religious leaders. After the death of Paul, the oldest apostle, John, spoke of apostates who were undermining the efforts of God's true Church. "Little children, it is the last time: and as ye have heard that antichrist shall come, even now are there many antichrists; whereby we know that it is the last time. They went out from us, but they were not all of us ..." (I John 2:18-19). False apostles continued down through the centuries to deceive the gullible. Soon the false church surpassed the true Church of God in size and influence. False Christianity became confused with the true Church instituted by Jesus Christ. God's small and scattered flock disappeared into obscurity. The only remaining records being those of her enemies. Centuries of intense persecution forced the body of Christ to go underground. Traces of it are seen here and there but it never again was to become a substantial or influential entity again until the latter part of this very century! Today God has raised up a faithful body of believers in order to proclaim the end-time message of the coming Kingdom of God. He has set before them open doors to preach that gospel or good news. Radio, television and the printing press are all being utilized to carry that vital message which for centuries has been suppressed by those who hold down the truth in unrighteousness (Romans 1:18). But just what is the Church? Is it a group of buildings? An organization of men and women? Chapter Three — What Is the Church? TO SOME, the Church is a building to which one goes on a Sunday morning. To others, it is the sum total of all Christendom with its myriad organizations, orders, sects and denominations. Still others believe their particular human organization is the Church of God. But what is God's definition of the Church? The Apostle Paul, referring to Christ's present position at the right hand of God the Father, said that the Father has "put all things under his feet, and gave him to be the head over all things to the church, which is his body, the fulness of him that filleth all in all" (Eph. 1:22-23). Again we are told that Christ is" … the head of the body, the church … " (Col. 1:18). The Church, then, is the spiritual body of Christ. It is the organism through which He works. But, just how is it the body of Christ? How the "Body of Christ"
The twelve disciples became the twelve original apostles (Judas Iscariot excepted — Matthias was chosen in his place). But how did they, with the other disciples, become "the body of Christ"? It was the power of God's Holy Spirit dwelling in His individual human body doing the work of God. Without this same Spirit dwelling in them, His disciples would utterly impotent. The very night before His crucifixion He said to them: "As the branch [of a grapevine] cannot bear fruit of itself, except it abide in the vine; no more can ye, except ye abide in me. I am the vine, ye are the branches … without me ye can do nothing" (John15:4, 5). It is the sap flowing from the vine into the branch that produces grapes. It is the Spirit of God and of the living Christ, flowing into the collective Body that is the Church, that produces the results. After His resurrection, just before ascending to God's throne in heaven, Jesus commanded these apostles "that they should not depart from Jerusalem, but wait for the promise of the Father" (Acts 1:4) – that is, for the Holy Spirit, the same power that did the Work of God in Jesus' human body. But how may one become a member of the body of Christ? Is it merely a matter of joining the "church of your choice"? Jesus said: "No man can come to me, except the Father which hath sent me draw him: and I will raise him up at the last day" (John 6:44, 65). One cannot decide to join the body of Christ. It is something God must put you into. We are instructed by the Apostle Paul that " … now hath God set the members every one of them in the body, as it hath pleased him" (I Cor. 12:18). It is God alone who decides who will compose the body of Christ. It is God who adds to the Church those whom He chooses to be saved. ". .. And the Lord added to the church daily such as should be saved" (Acts 2:47). How, then, does God add a member to the Church? Is it a matter of signing on some dotted line? What is it that signifies membership in the Church of God? Paul informs us: "For by one Spirit are we all baptized into one body, whether we be Jews or Gentiles, whether we be bond or free; and have been all made to drink into one Spirit" (I Cor. 12:13). One cannot put himself into the Church by "deciding to join." When he becomes a son of God, by having and being led by the Holy Spirit of God (Rom. 8:14), then God has put him into the Church. "Joining" a group that calls itself a church — having one's name on the membership roll of some group calling itself a church —does not make one in true fact a member of the Church Jesus founded. Here is positive proof: "But ye are not in the flesh, but in the Spirit, if so be that the Spirit of God dwell in you. Now if any man have not the Spirit of Christ, he is none of his" (Rom. 8:9). Who Is the Head of God's Church? Who is the real Head of God's true Church today? Jesus Christ? Or some human individual? Some think that Matthew 16:18 proves that Christ turned the headship of the Church over to men. But, what is the real truth? Let us examine this scripture very closely. Jesus said: "And I say also unto thee, That thou art Peter [Greek inspired original word, petros, meaning a "stone"], and upon this rock [Greek inspired original word, petra, meaning a "ledge" or "shelf of rock" or a "crag "] I will build my church " (Matt. 16: 18). Now, since some claim that the rock on which the Church was founded refers to Peter — and not Christ — notice the true meaning, as originally written by Matthew in the Greek language. The English versions of today are translations from the original Greek. Peter was also called Cephas (Greek Kephas, from the Aramaic Kepha). In John 1 :40-42 is related how Andrew, Simon Peter 's brother, found Peter, and brought him to Jesus. "And when Jesus beheld him, he said, Thou art Simon the son of Jona: thou shalt be called Cephas, which is by interpretation, A stone" (verse 42). The English word "stone" is translated from the Greek word petros, meaning a single stone or loose stone. Also the Greek word Kephas means such a stone, referring definitely to a human man. But when Jesus said "upon this rock I will build my church" (Matt. 16: 18), the Greek word, as written originally by Matthew, was not either Kephas or petros, but petra, which means a large massive rock. The Greek petra cannot mean the human Peter, but the glorified Christ! Speaking of the Israelites under Moses in the wilderness, Paul writes: " … for they drank of that spiritual Rock that followed them: and that Rock was Christ " (I Cor. 1 0:4). Testament prophets], Jesus Christ himself being the chief corner stone." Here Christ is plainly said to be the chief, or head. The real foundation of the Church is Christ. "For other foundation can no man lay than that is laid, which is Jesus Christ" (I Cor. 3:11). And Jesus Himself said: "I will never leave thee, nor forsake thee" (Heb. 13 : 5). He is shown in Revelation 1 : 13, 18 to be the Living Head, spiritually in the midst of the Church. Read of it also in Ephesians 5:23; 4:15; 1:22-23; Colossians 1:18; 2:19. Christ is alive today! For more than 1900 years. He has been the Living Head and High Priest of the true Church, which He built. The Holy Spirit is given by the laying on of hands following baptism (Acts 19:5, 6). A person who receives the Holy Spirit is "begotten" or conceived of God. Following a life of developing and overcoming, the Christian is "born" into the Family of God at the resurrection and return of Christ (I Cor. 15:50-54; I Thess. 4:13-17; Rev. 20:4-6; Phil. 3:20-21; I John 3:1-2; II Tim. 4:8). That body of believers, having the Holy Spirit of God, constitutes the Church of God. But does this mean that the Church has no organization? The Church of God is a spiritual organism. Christ is its head and it is composed of ministers and lay members. It is the minister's responsibility to feed the flock (see John 21:15-17; Luke 22:32). He is required to be spiritually elder. Biblical standards governing the ministry are enforced in the true Church. The Apostle Paul wrote to the young evangelist Timothy: "A bishop [minister or elder] then must be blameless, the husband of one wife, vigilant, sober, of good behavior, given to hospitality, apt [able] to teach; not given to wine, no striker, not greedy of filthy lucre [undue monetary riches]; but patient, not a brawler, not covetous; one that ruleth well his own house, having his children in subjection with all gravity; (For if a man know not how to rule his own house, how shall he take care of the church of God?) not a novice [a new — comer] … " (I Tim. 3:2-6). True ministers of God, Christ—chosen according to these strict biblical standards, are very concerned about the laity (individual church members). They willingly feed the flock of God (I Pet. 5:1-3). They strive to bring the Church to spiritual maturity (Eph. 4:11-13). On the other hand, lay members of God's true Church respect and obey the ministry (Heb. 13:7, 17). Now some questions naturally emerge. Can one who does not know of the true organized Body doing God's Work, and therefore is outside of it, be a member of the true Church which Christ built? The answer is yes — for it is possible for one to have truly repented, believed, and received God's Spirit — and be following that Spirit as far as he sees and understands — who does not know of the organized Work Christ is using today. But surely God's Spirit in him would lead one, in due time, into his part in the organized Body the living Christ is directing. Is it possible that one who has joined a sect, church, or denomination not doing God's Work, might be truly converted, and led by God's Spirit in him? The answer is yes — we have known of a few. But in every case, either they came into the organized spiritual organism Christ is using in the real Work of God— or, when their eyes were opened to further light and truth, they rejected it and lost the Spirit of God. And this was amply demonstrated by the fruits. Why the Church of Jesus Christ? Jesus Christ, the Messiah, was born in Bethlehem in Judaea. He was the Son of God in the flesh. His ministry lasted from the fall of 27 A.D. to the spring of 31 A.D. He came to do the Work of preaching the gospel of the coming Kingdom of God and to die for the sins of mankind. Part of His work consisted of training disciples (students or learners) to carry on the Work after His death on the cross. At the completion of His ministry, He had 120 such students. At least twelve of them became apostles (Acts 1:15, 26). Even Nature Is Organized God is Creator. Everything God has created in nature is organized. Take a sturdy, beautiful oak tree. It has a root system in the ground. It has a main trunk. It has major branches joining to that trunk, smaller branches joined to them, still smaller branches joined to each minor branch, and finally the twigs joined to the smallest branches. But they are all joined together as a system. Jesus used the example of the vine. He is the Vine, we the branches (John 15:1-8). Unless we are joined systematically to the Vine, we can produce nothing. In a grape vine, there is order— system— organization. The whole Work of God functions toward the restoration of what has been taken away from the earth — the government of God. The Kingdom of God is that government. That government is an organized government. God's form of government is government from the top down. God the Father is the extreme top. Under Him is the living Christ, administering God's government as God directs. And Jesus has set organization — government-order-in the Church, under Him. God compares this organized Body of Christ to a building. "Now therefore ye … are built upon the foundation of the apostles and prophets, Jesus Christ himself being the chief corner stone; in whom all the building fitly framed together groweth unto an holy temple in the Lord: in whom ye also are builded together for an habitation of God through the Spirit " (Eph. 2: 19-22) . The living Christ, Head of the Church, has put the various administrators, officers, and members into the Church as He Himself chose (I Cor. 12:18, 28). Not as a man chooses for himself. was limited to the confines of the Roman Empire and a few other countries. One by one, tradition tells us, they were martyred. John outlived all the others. Following John's death around the end of the first century, others carried on the Work. But from that time on, the organized preaching of the gospel on a large scale fades from view. Of course, the true Church continued to exist alongside a growing counterfeit of biblical Christianity described in chapter two of this booklet. However, the true Church never died (Matt. 16:18). It continued through various stages or eras, but not as a powerful worldwide organization. It existed as a relatively obscure, scattered and powerless entity for centuries. But it never lost the basic truths of God. The true Church recognized the true gospel. And undoubtedly the gospel was preached on a small personal scale. But following the death of John, the organized preaching of the gospel on a powerful basis ceased. The Church was persecuted and its numbers decimated in great martyrdoms. The concentrated power of the "holy people" was scattered so that a worldwide Work was virtually impossible. It was not until this modern twentieth century that God again raised up a Work of sufficient size and influence to preach the gospel on a powerful worldwide basis! Today the primary objective of the Church of God is to preach and publish the gospel of the soon-coming Kingdom and government of God (Matt. 24:14; 28:19-20; Mark 13:10). God has commissioned His Church to cry aloud and spare not, and show our peoples their sins (Isa. 58:1). Its job is not to appease or cajole a sin—laden society. It is to warn and witness to a world bent on self—destruction! As an additional responsibility, God's Church represents His way of life on this earth. Its members are commanded by Christ to. be a light to the world (Matt. 5:14-16). A light shows the way. It sets the example. The Church is called collectively the "salt of the earth." Notice. The gospel includes the knowledge of just how the world may obtain peace, of how good may prevail against evil, of how salvation may be achieved. It proclaims the coming rule of God. The Apostle Paul quoted Isaiah in Romans 10:14-15 showing that he was indeed referring to the Church. In summary, Jesus said: "And this gospel of the kingdom shall be preached in all the world for a witness unto all nations; and then shall the end come" (Matt. 24:14). The Church is for the purpose of preaching that gospel to the world just before the culmination of this society. The Spirit—led Christians of the Church of God provide the human instruments through which God does His end-time work. IN THE confusing hodgepodge of denominational Christianity, how can you locate the true Church of God? Do not all claim to be a part of the body of Christ? Will any Church say it is not the Church Jesus founded? It is necessary to go to the Maker's Instruction Book — the Bible — to find out just how you may locate the Church which truly represents God's way on this earth. The true Church upholds God's law. It recognizes that God set in motion a law that would bring (if obeyed) humanity every good thing — abundant well-being — a full life. God's Church boldly proclaims that His law is not done away, but has been Christ—expanded to cover every aspect of human activity (lsa. 42:21; Matt. 5). The true Church says with David: "Thy word is a lamp unto my feet, and a light unto my path" (Ps. 119:105). It recognizes that God's law is one of His greatest gifts to mankind. The apostles later preached that same message of the coming world government of the Kingdom of God. This is the only gospel message acceptable to God. "But though we, or an angel from heaven, preach any other gospel unto you than that which we have preached unto you, let him be accursed. As we said before, so say I now again, if any man preach any other gospel unto you than that ye have received, let him be accursed" (Gal. 1:8). The true Church of God is the vehicle through which God administers salvation. It understands the ultimate purpose of human existence. God has a plan by which mankind can be born into the very divine Family of God. It involves repentance, the forgiveness of sin, water baptism, and full redemption and salvation (see Acts 2:38; 3:19). No other Church but God's truly understands that man is to become God! The Apostle John wrote toward the close of the first century: "Beloved, now are we the sons of God, and it doth not yet appear what we shall be: but we know that, when he shall appear, we shall be like him; for we shall see him as he is" (I John 3:2). Jesus Himself was criticized for saying that He was the son of God. He answered: "Is it not written in your law, I said, Ye are gods. If he called them gods, unto whom the word of God came, and the scripture cannot be broken ..." (John 10:34-35). A real Christian is destined to be born into the very divine Family of God! Almost no one really seems to understand this vital point. This is another earmark of the true Church which God has called out of this society and given His truth to. Jesus said: "... It is given unto you to know the mysteries of the kingdom of heaven … " (Matt. 13:11). "Beware of false prophets, which come to you in sheep's clothing, but inwardly they are ravening wolves. Ye shall know them by their fruits. Do men gather grapes of thorns, or figs of thistles? Even so every good tree brings forth good fruit; but a corrupt tree bringeth forth evil fruit" (Matt. 7:15-17). What are the results of the labors of this world's churches? Poverty, squalor, misinformation, broken homes, divorces, permissiveness, etc. But what are the fruits borne by those who possess God's Holy Spirit? "But the fruit of the Spirit is love, joy, peace, longsuffering, gentleness, goodness, faith, meekness, temperance: against such there is no law" (Gal. 5:22-23). There are as many names as there are churches. But what name did God place upon His people? What name does God use for His Church in the Bible? Surprisingly, the term "Christian" was first coined at the Gentile city of Antioch. "And the disciples were called Christians first in Antioch" (Acts 11:26). Antioch became the headquarters for the Apostle Paul's evangelistic efforts to the Greek—speaking world. The expression "Christian" is used only twice more in the Bible — by King Herod Agrippa II (Acts 26:28), and by the Apostle Peter in I Peter 4:16. Peter wrote: "Yet if any man suffer as a Christian, let him not be ashamed; but let him glorify God on this behalf." Jesus prayed that God the Father would keep the Church in His (the Father's) own name (John 17:11). But Christ is the Head of the Church (Col. 1:18). And Christ is God! The Church is actually an extension of the Family of God. Paul wrote: "For this cause I bow my knees unto the Father of our Lord Jesus Christ, of whom the whole family in heaven and earth is named" (Eph. 3:14-15). The Church is named by the Family name of God. When the Apostle Paul wrote to the churches, he used the expression "to the church of God ..." This name is used no less than twelve times in the New Testament as the name of the true Church (see accompanying box). Notice that Paul did not call the true Church after the name of a man or a method or even a church doctrine. Therefore we see that the true Church may be properly identified by its name, "the Church of God." But there are many churches with this same name. At least a dozen churches bear the name "Church of God" in the United States alone. Therefore we must look further. Not only must the true Church be named the Church of God, it must also be a Sabbath—keeping Church. We are told that the true Church keeps "the commandments of God" (Rev. 12:17). This includes the fourth commandment: "Remember the sabbath day, to keep it holy. Six days shalt thou labour, and do all thy work: but the seventh day is the sabbath of the Lord thy God ..." (Ex. 20:8-10). The True Name of the True Church What is the biblical name for the Church? The Bible gives the true name of the Church in twelve different places. Twelve is God's complete number for organizational beginnings. 1) "... Feed the church of God" (Acts 20:28). 2) "Give none offence, neither to the Jews, nor to the Gentiles, nor to the church of God" (I Cor. 1 0:32). 5) "… Beyond measure I persecuted the church of God" (Gal. 1:13). Where one specific local congregation is mentioned, the true Church is also called "the Church of God." Usually it is used in connection with the place or location. 6) "The church of God which is at Corinth" (I Cor. 1:2). 7) "The church of God which is at Corinth" (II Cor. 1:1). 9) … Behave thyself in the house of God, which is the church of the living God" (I Tim. 3:15). 10) " … We have no such custom, neither the churches of God" (I Cor. 11:16). 11) … For ye, brethren, became followers of the churches of God which in Judaea are in Christ Jesus " (I Thess. 2: 14). 12) "So that we ourselves glory in you in the churches of God" (II Thess. 1:4). Since Christ is the Head of the Church, Paul also called the various congregations "the churches of Christ " (Rom. 16 : 16) — but the actual name is The Church of God. In some New Testament instances, a descriptive adjective is added to the name. as the Church of God at Corinth, or the Churches of God in Judaea. And — today, it is The Worldwide Church of God. God and His people. "It is a sign between me and the children of Israel for ever ..." (Ex. 31:17). Today's Christians are spiritual Israelites (Gal. 3:29). The keeping of God's seventh—day Sabbath is a further way of isolating and identifying the true Church of God. This narrows the field considerably. The true Church of God should be showing the way to world peace and human harmony. It should be demonstrating proper family relations (Mal. 4:5-6). It should be living by and practicing every word of God ' (Matt. 4:4; Luke 4:4). God's Church does not attempt to "demythologize the Bible," it believes all of the Bible to be inspired and God—breathed. God's people believe that "all scripture is given by inspiration of God . . ." (II Tim. 3:16). True Christians derive their doctrines strictly from the Bible (Isa. 8:20). They do not rely on human traditions or ideas. The true Church uses the Old Testament as did Christ, the Apostle Paul and all the other New Testament apostles and elders. It does not merely hold to the "Psalms, Proverbs and the New Testament" as some seem to do. The Church of God, then, must be a Sabbath—keeping Church with the correct name. It must keep all ten of the Ten Commandments and live by every word of God — not rejecting part of the Bible. It is God's Church because it collectively possesses the Holy Spirit. It preaches the true gospel of the coming government of God, bearing the good fruit of the Holy Spirit. How many churches do you know that fit that description? Only God can place one into the body of Christ. The true Church is not something you may "join" — it is something you are immersed into by the Spirit of the living God. But, if God is leading you by His Spirit to His truth, it is up to you as an individual to seek Him. Isaiah wrote: "Seek ye the Lord while he may be found, call ye upon him while he is near: let the wicked forsake his way, and the unrighteous man his thoughts: and let him return unto the Lord, and he will have mercy upon him; and to our God, for he will abundantly pardon" (Isa. 55:6-7). And God warns through the same prophet: "And there is none that calleth upon thy name, that stirreth up himself to take hold of thee ..." (Isa. 64:7). Will you stir yourself up? Will you search out the true Church and become a part of it? It is your choice!